Did you know you can book group study rooms online, as well as from within the library? 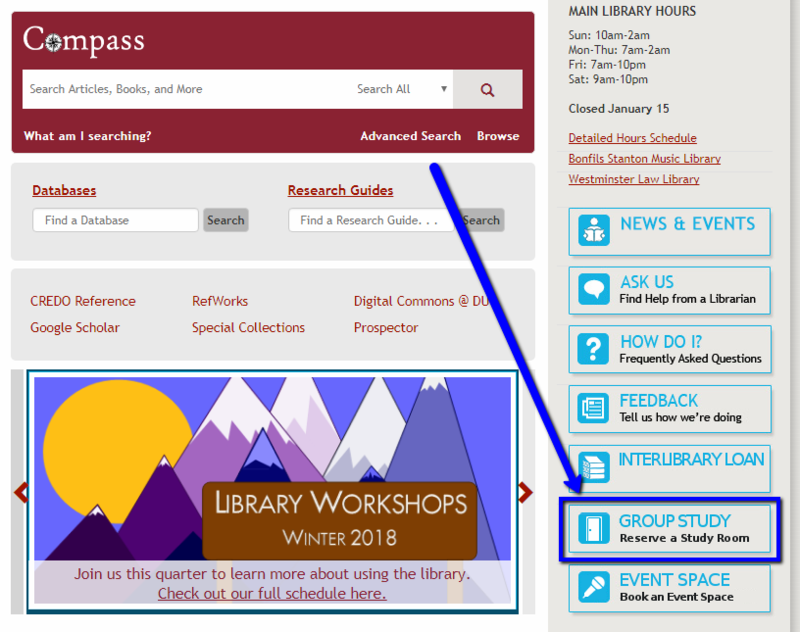 Book online using the “Group Study” button on the library homepage, library.du.edu. You will be redirected to a PioneerWeb portal used to reserve these rooms, where you can login using your usual DU credentials. Be sure to "Submit" your room reservation and check for a confirmation email before logging out and navigating away from the PioneerWeb Room Reservations system. You can book a room while you are in the library using the digital control panels outside the door of each group study room following the instructions posted by each control panel. If you want to use a vacant study room, check the digital panel outside the room to see the next reservation time for the room. Walk-ins? Remember to book at the door using the control panel so you aren’t bumped by another group booking online! Group study rooms are intended for 2 or more students, not for individual use. There are individual quiet study areas throughout the library. Try the Deep Quiet Study Room on the upper level or the wood study carrels on all three levels if you want to study alone and quietly.